HIGHLIGHTING THE MEMBERS OF THE BROOME TALENT TASK FORCE AND THEIR CONTRIBUTIONS TO ENRICH AND EMPOWER BROOME COUNTY. We last featured Jan Hertzog, director of continuing education and workforce development at SUNY Broome Community College. Our next feature is about one of Broome's fastest growing employers and life-long resident. 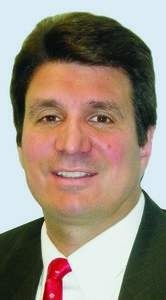 Anthony Paniccia, president and CEO of Delta Engineers, Architects & Land Surveyors serves as a co-chair on the Broome Talent Task Force with Peter Newman, regional president of M&T Bank. A native of Endicott, Anthony has always felt that Broome County provides the ideal balance of work and community. In that regard, Anthony serves on the Boards of numerous community organizations and believes that everyone in the business community possesses the ability to give back in one or more of the following ways: with their time, their talent, or their treasure. Anthony knows that all of our major employment sectors are facing employment shortages. He thinks that by getting kids interested in those fields at a young age and encouraging those who don’t want to go to college to acquire a skill that can land them a good-paying job, we have the ability to meet those needs and provide a vibrant workforce for Broome County. As an employer, Delta Engineers is growing by leaps and bounds. Over the last several years, Delta has added dozens of new positions throughout their company and plans to expand even more. Anthony prides Delta on providing opportunities for internships for both high school and college students and is always seeking to hire graduates who would like to stay in the community. Did you know that architectural and engineering services provide an annual average wage of nearly $55-75,000? In addition, the economic impact of sales, output and compensation in the A&E field is more than $37 million. Nearly 60% of employees in the A&E field have either an Associates or Bachelor’s degree and roughly 20% hold a Masters or other advanced degree, the remaining 20% hold a high school diploma or some college.